Don’t throw it out! Learn how to get paint out of clothes, so you don’t have to throw your favorite piece in the trash. 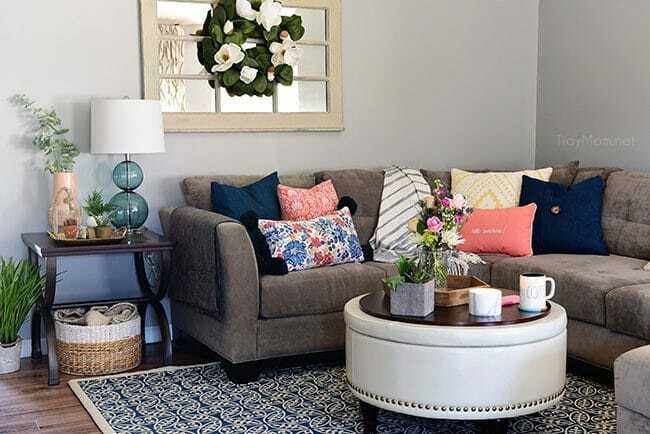 We’ve been in the middle of working on our family room makeover, that I told you about a few months ago. We decided to wait until the holidays were over to really get started. As soon as the Christmas tree came down, we got to painting. I finally decided on Benjamin Moore Coventry Gray and couldn’t be happier!! It’s the perfect gray paint color! I can’t wait to share some pictures of the progress soon. During the painting, my husband happened to walk thru the room with his favorite coat on and brushed a corner with fresh paint……and you guessed it, he ended up with paint on the sleeve. You should have seen the disappointment on his face when he told me about it – after it was dry. I told him, no worries, I know a little trick that should get dry paint out of clothes, and since the jacket was machine washable, it should come right out! This method is 99% effective, and is worth a try! Since you already have paint on the garment, you don’t have much left to lose, right? It’s definitely worth the effort, I promise! 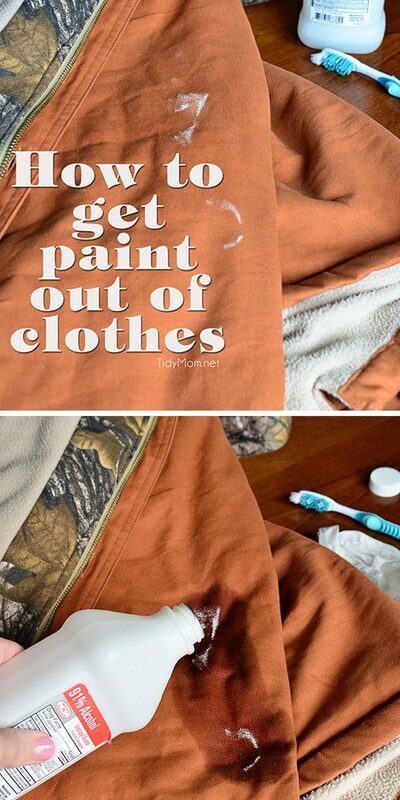 Paint can be removed from clothes, especially if you act quickly. 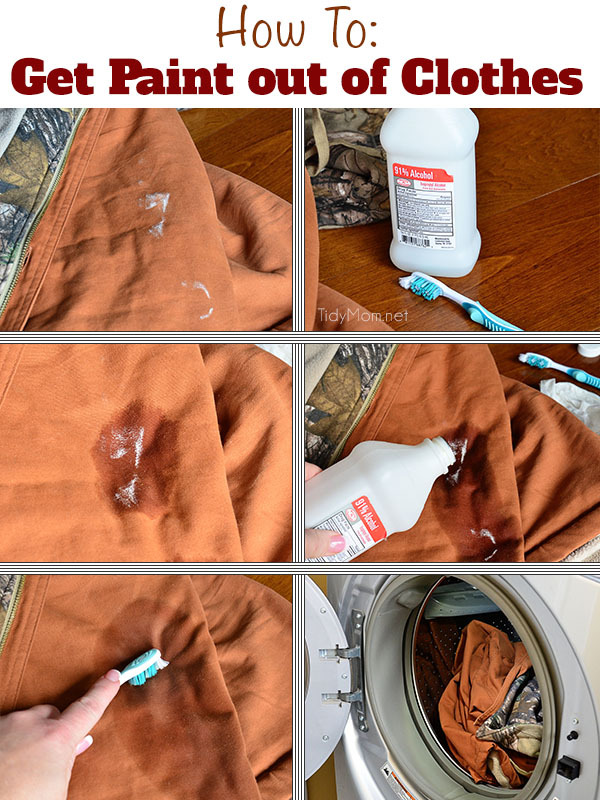 I’m going to explain how to remove water-based paint from clothes that can be machine washed. All you need is an old cloth, 91% Isopropyl alcohol (aka rubbing alcohol, you can get at the drug store or Amazon) and a brush (I used an old toothbrush). Act As Fast As Possible: Try to follow the steps below as soon as possible, because once the paint dries, it can become more difficult to remove. If you are not able to treat it quickly, try to keep the paint stain wet until you can treat it properly. Remove Excess Paint Before Treating: Use a spoon or flat side of a table knife to scrape excess paint from the fabric. Working from the back of the fabric, flush the stain under warm running water. 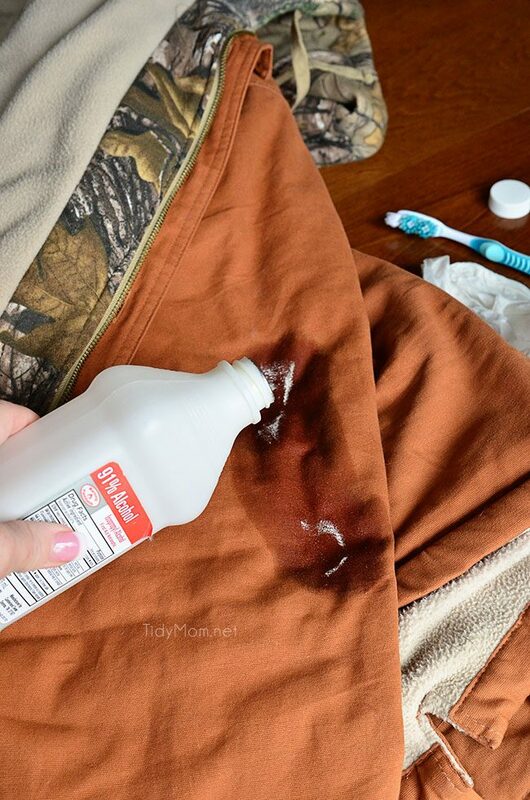 Or blot stain with a clean rag to absorb as much of the remaining paint that you can from the fabric. IF Paint Has Dried: Use a spoon, dull table knife or hard bristled brush to scrape away as much paint as you can from the fabric. Now that you’ve gathered what you need and scraped away what you can, you’re ready to get down to business. Don’t worry, you’ve got this! Use a wet cloth to get the area with the paint wet – it doesn’t need to be soaking wet, just dab it with the wet cloth until the fabric is wet. Use your brush to scrub until the paint is no longer visible. (if needed, add a little more alcohol while scrubbing) you will see the paint break down and crumble. 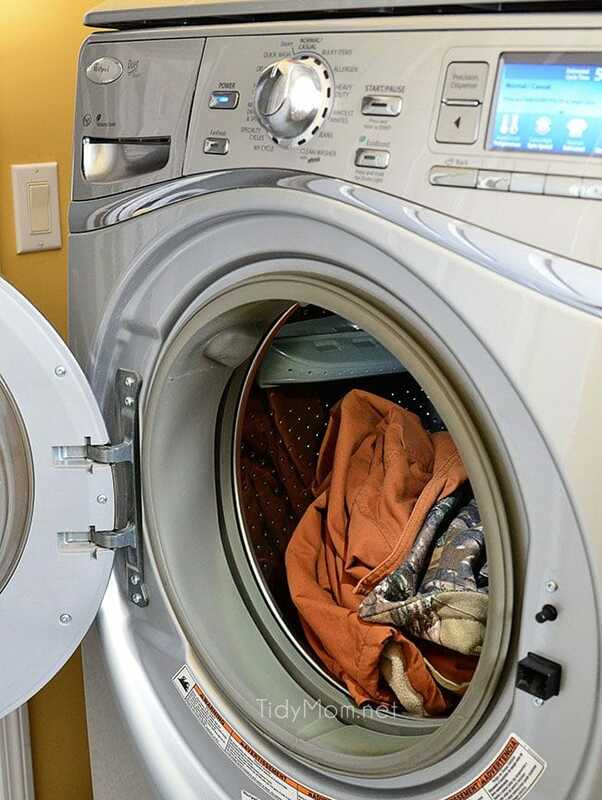 Place garment in the washer and launder according to the label. It should look as good as new! Remember, unexpected painting accidents don’t have to mean disaster. 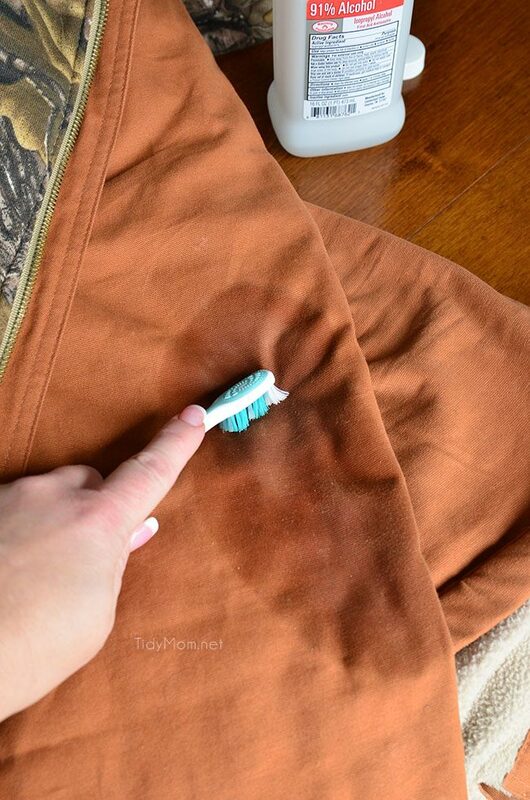 As long as you act quickly and follow the instructions on the garment care tag, these handy tips should help you remove paint from your favorite clothes in no time at all. I’m a big fan of anything that will save clothes and money. Especially when they’re a favorite jacket or sweatshirt! 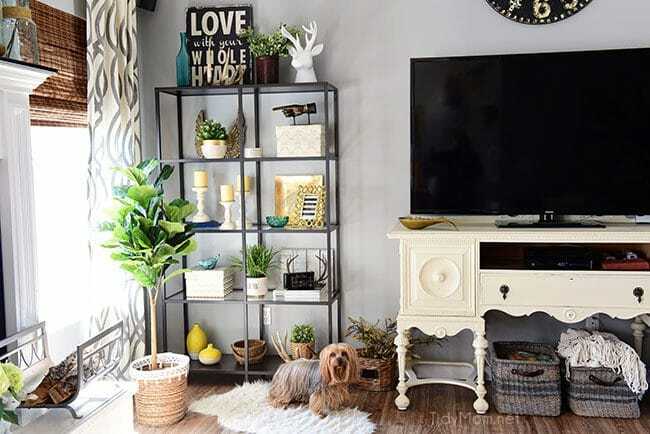 See how the perfect gray paint looks in our home! It’s been four years since we painted the family room and I still love the color!! 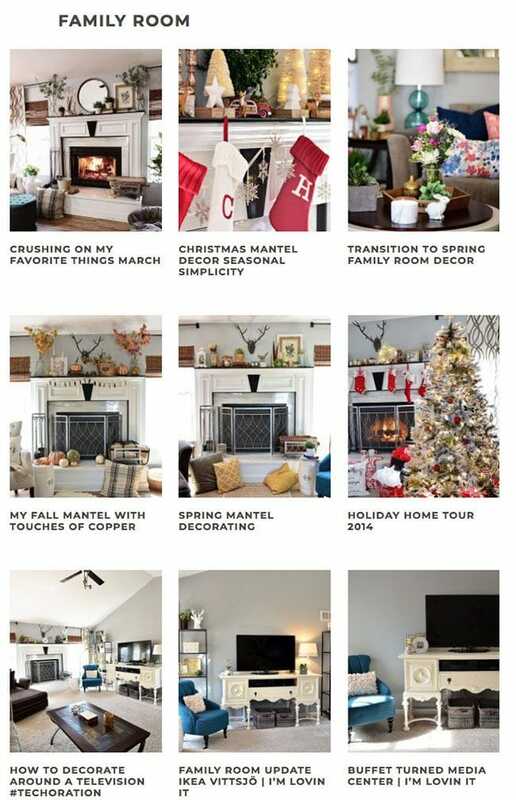 See all the updates to our family room decor by clicking the image below. 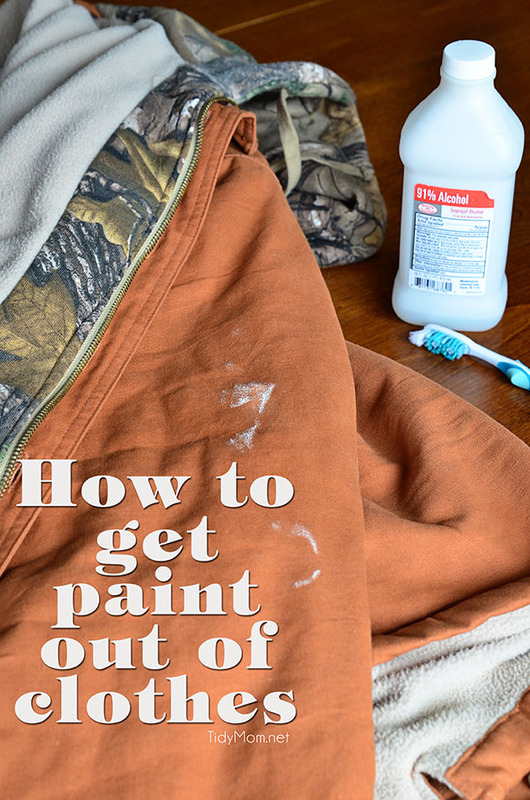 Like this tip on How to Get Paint Out of Clothes? PIN IT! WOW! Amazing and amazingly easy! Thank you so much. Thanks for the tip! I had a North Face jacket with paint on it and it came out beautifully!!! I will pass this on! I just tired this on a spot that happened 4+ years ago. The jacket has been washed several times since and I had given up hope of ever getting out the paint. Well, it worked! I am beyond excited to have the jacket back I my wardrobe! “thru” “beautiful gray walls” “?” Either this was written by a suburban white mom or an 8 year old. someone got up on the crabby side of the bed today. Through and thru are different spellings of the same word. Hope you’re day gets better………. and of course my email reply bounced back because you used a fake email. My son leaned against an oxidized door at the school in his brands new soccer jersey. will this work on that to? i am desperate. Either this comment was written by a grumpy, nasty, ungrateful person or…nope, just the one explanation. How’s that snide negativity working out for you? Did it get the paint out of your clothes OK? I just read these comments and thought: Wow! I was looking for a tip, not an English lesson. “Thru” is used in many types of English literature. If you are looking for some good tips, you came to the right place. If you are The Grammar Police, you googled wrong. 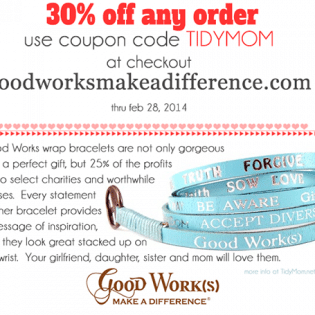 You rock, TIDYMOM! Through and thru are both spelled correctly. In formal writing (which I do not consider this site or most sites / blogs of this nature to be) through is most certainly the de-facto standard. With that said, there are valid reasons to use thru in informal writing, such as the example being complained about. The author of the site is communicating a cleaning tip, which based upon some commentary, provides real value. The authors tip in no way was or is compromised by the use of thru versus through, thus it is safe to say she has effectively used (the reader [her audience] can understand her meaning) this form or variation of the word in the context of what I consider a non-formal written communication. Now for the use of the word gray versus grey, both are acceptable however, gray is favored in the USA and grey throughout the United Kingdom and perhaps elsewhere. Additionally, if you are struggling with depression, as one individual mentioned) please seek help and I mean that with all seriousness. One should realize if focusing in on a word or how people use said word causes or contributes to ones depression, perhaps there is a larger issue that should be examined. Finally, Cheryl, of Tidy Mom, thank you for your suggestion, it is exactly what I was searching for and I hope that I will have the same positive results as some of your other users have had. I TRIED THIS AND IT WORKED GREAT. 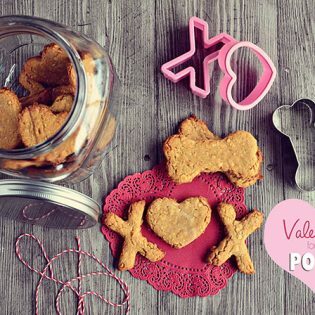 Are you really a mom or is there a social media wizard behind this blog? An irresponsible housepainter got paint on a nice dress hanging in my closet – this worked! I was wondering if paint could be removed from a leather coat. Please? So I washed my jacket already thinking the paint would come off but it didn’t and was super upset. Ha so I looked up how to get rid of paint. Do you think this rubbing alcohol trick will still work?? This worked great. I got the paint stain off of my daughter’s coat and it looks brand new!!! Thank you! Also, if you people don’t like the spelling don’t read the blog and save your rude comments. I’m sure you tried this trick and it worked great how about you at least say thanks for the tip. Great solution! This even worked on a paint stained jacket that had been washed and dried before the rubbing alcohol treatment. I recommend a stiff bristle brush over a tooth brush (too soft). THANK YOU! Quick question..I have a small paint stain on a dry clean only comforter. Is it necessary to wash or launder the comforter after cleaning it with alcohol ? Tried this on a polyester hoody. Will 91% Isopropyl alcohol also get our vanish? sorry, worked on dried paid on my husband’s jacket. Thank you, thank you for posting this! My husband also somehow got paint on his coat and we didn’t notice it until it had dried. We all thought it was a lost cause but this took it right out!! Very, very grateful! Will this work on cotton clothing? I sure hope you don’t have many people like that who choose to write you. I enjoy all your tips and I know your methods work. I bought your book and have has great. Success!!! Thank you for the tip , all tips for that matter !! I dont know what brand she used, but I know she the color was “Coventry Gray” I also love this color and will be on the look out for it next time I paint! Tidy mom don’t let the trolls get you down. Some people can only momentarily escape misery by trying to drag the rest of us down. Thanks for the advice can’t wait to see how my green hoodie comes out! Fingernail polish remover takes out paint stains too, atleast latex paint. Same as acetone it disolves it but dont know if different fabrics can handle it. Do handyman work and it works wonders. Does the alcohol rub to get paint off work with both oil and latex paints? Do you think 99% isopropyl alcohol will do as well? I can’t get 91% here where I live. Thank you for your advice and have a beautiful day! 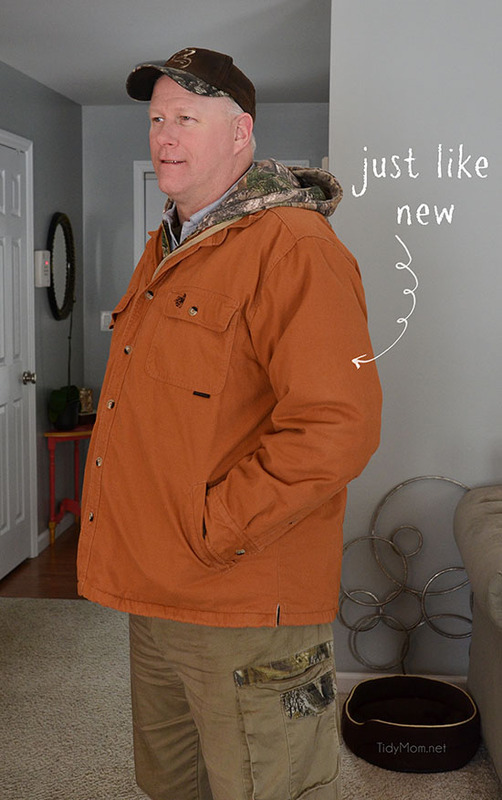 Thanks for the tip, my daughter has an expensive sweater that I tried this on, it worked without even fading the fabric. I ciuld kick myself when I think of all.of the clothes I’ve tossed out because they had paint dried on them. Well, you learn something every day. I hope this works, I have a shirt and tennis shoes. How can I reach thru a personal email. I lived in St.Louis and I am desperate for a recipe I received while living there. I’m so late to the party but you gotta give credit where credit is due! My daughter’s camp didn’t think to put a smock on a 6-year-old and she had on a new first day of camp outfit 🙁 The shirt was bad and the shorts had splatters. Now I had to use more than a little and a scrubber instead of a toothbrush, but the outfit has been saved! Thank you very much for this tip and I now have a new blog to follow! What I bought at WalMart was only 70% Isopropyl Rubbing Alcohol – do I need the 91% to get out paint or will this work with a little more scrubbing? Works Great!! Spilled white paint on my nike running shorts and was so disappointed. I am so glad the stain came out, I can finally wear them again! yay!! so glad it worked for you too! It didn’t work for me and I don’t know if that is because I used it on denim pants for if its because of something else. Got any tips if I try it again? some stains are more tough and might take more than one treatment. I wore my super comfy knock-around jeans while painting my whole house his summer. Needless to say, I got quite a bit of paint on them – flat and semi gloss. I’ve really been missing those pants but don’t dare wear them for fear of being caught! LOL. I took a chance and googled how to get paint out clothes and found your page. I’ve just finished scrubbing – close to an hour – and they’re in the wash now. I can’t wait to wear them again. Your tip worked great! yay!! so glad it worked for you!!! Hallelujah ! This got out 31 year old “Hot Pink ” paint out of my daughter’s baptismal gown! I didn’t see this til about 2 days ago and before I soaked for about 5 days n scrubbing with my trusty degreaser/cleaner Krud Kutter that usually gets paint out . But it still didn’t get some out, so I googled and your blog post on getting paint out popped up. Thankful with persistence of using your tip over and over , soaking it and scrubbing many times throughout the day loosened more off. Just the color was still there, so I washed in on soak cycle with OxiClean and it’s beautifully white! Thanks so much, now my 1st Granddaughter will be able to wear on her baptismal day! Thankful Oma here! Thanks! Saved my new jeans.. I was close to throwing them away after trying several methods. I’ve been known to wait till all of the painting is done and treat all of the clothes I’ve worn during painting at same time. I’ve ALWAYS have been able to get ANY paint, or grease out with a product called Lestoil. It’s an old school product that I get at ACE Hardware. Sadly today I ran out and don’t have time to get some, but I do have the alcohol so I’m going to give it a try! So thanks for the tip!! Thank you so much : ) I bought a beautiful white top for my hols & couldn’t resist wearing it beforehand. I’d been decorating earlier & took a used tin of paint to the dustbin & somehow managed to get paint on my top! I never noticed until the next day when it was dried on. I was gutted as the top was part of a two-piece outfit. I found your site & it was so simple – worked like a dream 1st time. Yayyyy! I tried this on an under armor shirt that had washable paint on it. Not only did it NOT touch the paint it bled the black design of the shirt onto the green fabric. Thanks for making my shirt worse. If it was *washable* paint then why didn’t you just *wash* the shirt?!!! Ok I’ve read the comments and imma try it so i hope it works. my son has a pair of regular knit gloves that are hard to replace since they are his favorite fluorescent yellow color. At Cub Scout camping he decided to wear them while using black paint to decorate pumpkins. Couldn’t use a toothbrush to rub since it would obviously ruin the gloves. I soaked the gloves in alcohol in a plastic food container and shook it for about ten minutes. It worked!!! Thank you! My apartment complex came and painted my front door today while I was at work. I came home to see they got blue paint on the arm of a red couch/settee I had sitting by the door. I’m so disappointed, but I’m going to try this and hope it comes out! If it doesn’t work, I’m going to try the Lestoil someone mentioned in a comment. I just don’t want to fade the fabric. Some people don’t have anything better to do with their lives :(. Sorry the hate found you @tidymom, not everyone in the world is like that. I had a rather rude Monday 2 weeks ago and I just laughed it off. Went on a girls night to painting with a twist amd got paint on my shirt, trying your trick now while babied are napping!